Thanks for the response. It’s good to know I’m on the right track so far with the yeast. I’m pretty lucky in that the room in my basement that I use stays around 66-68 degrees year round. It’s also dark 99% of the time which should also help with any UV exposure. That may be an alright ambient temperature for fermentation just make sure you chill the wort to under 65f. Initially fermentation creates heat so if you pitch 70 or above you will get to warm. You want to let it rise into the temperature. 70 is a nice temperature for an English yeast the lower range will give you a cleaner beer. Good to know about the wort temperature. Thanks. I'll make sure to get it under 65 before adding the yeast. Any other bits of advice for the stout before I get it started? For comparison on what I'm trying to create my all time favorite Oatmeal stout is the Anderson Valley Barney Flats. If I could get anywhere close to that I would be a happy man. One of the hard parts of making and bottling a stout is getting the carbonation right. If it's over carbonated it won't taste the same. I have a Porter I bottled that is over carbonated . To fix that I first pour it into a wide mouth snifter glass then pour it back and forth in another to release the gas. You can swirl it an the glass a bit also. This will give you a nice creamy mouth feel. I find this easier than the syringe method. A swamp cooler is the about the least expensive and easy to make way to drop your fermentation temp. A plastic tub, some empty plastic soda bottles, a fan and an ole t-shirt or towel is about all you need. It is technically an evaporative cooler I think. Google or search here for lots of info. The next step is a fridge or freezer with a temp controller. Good luck! I always thought a Stout was a great first brew attempt. The dark grain can sometimes hide small off flavors. If you brew an Oatmeal Stout that's not a kit, quick oats from the grocery should work fine. Thanks for the info. I have a refrigerator in the basement but it will take me a little more time to convince my wife into letting me convert into a kegerator! I'll have to take my chances with what I have or go the swamp cooler route. I'll give an update with pics as I go through the process. I really appreciate all the advice so far. Start simple... Impress the wife with all the great brews and gitten' equipment afterwards is a cinch! Good advice. I got her to help me bottle my very first brew tonight a one gallon “inn keeper” recipe and she thought it was fun. The whole time I was talking about how much easier it would be to put it directly in a keg with the new catalyst system. Baby steps. Much appreciated! I definitely will. I guess there could be worse ways to spend it. I can see how this could quickly get out of hand though. Of course you need to stock the shanty with home brew. 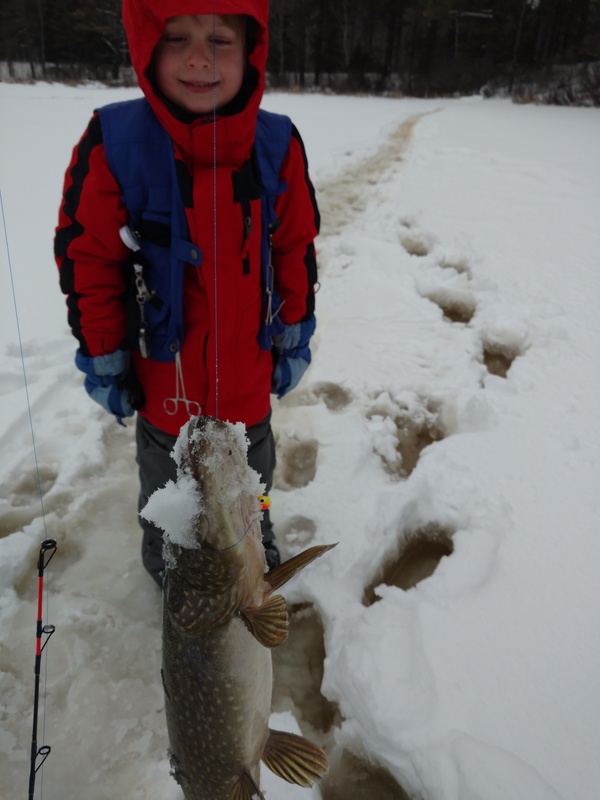 My 6 yr old grandson made up the list for ice fishing and included " and beer for Pops"
Nice! Fried fish, grandson and home brew. Priceless. My mountain bike obsession is way pricier so my wife is actually good with me making home brew, for now. I tend to get a little over the top though so I’ll behave until I start making great beer.